As I continue with my stay here in the city of Guanajuato, I realize that I am getting more and more used to the lifestyle here. I am getting much closer to my host family, they are very caring. It is interesting to think that there are many Mexicos, not only one. With that I mean that the lifestyle here in Guanajuato can be completely different from the north, south, east, and west of the country. There is many differences from state to state and even from the state of Guanajuato itself. My host family’s house is huge, from the terrace I can see the whole city, the view is beautiful. Most importantly they are committed to help me feel at home. I have gone several times with them to Leon. I have to be honest the houses that we visited are very nice, they are upper middle class homes. As for my classes I have made new friends and it definitely is a joy to be more emerged into the culture in a more academic way. I have learned new words at the college level, and I am striving to keep on reading books! Right now I am reading Octavio Paz “Laberinto de la Soledad.” This book has opened my eyes to so many things…. 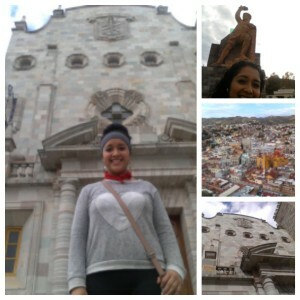 I love my stay here in Guanajuato and I would not change it for the world. Not only am I learning so much about my country, I am also learning tons about myself. Yesterday was one of the greatest experiences of my life. 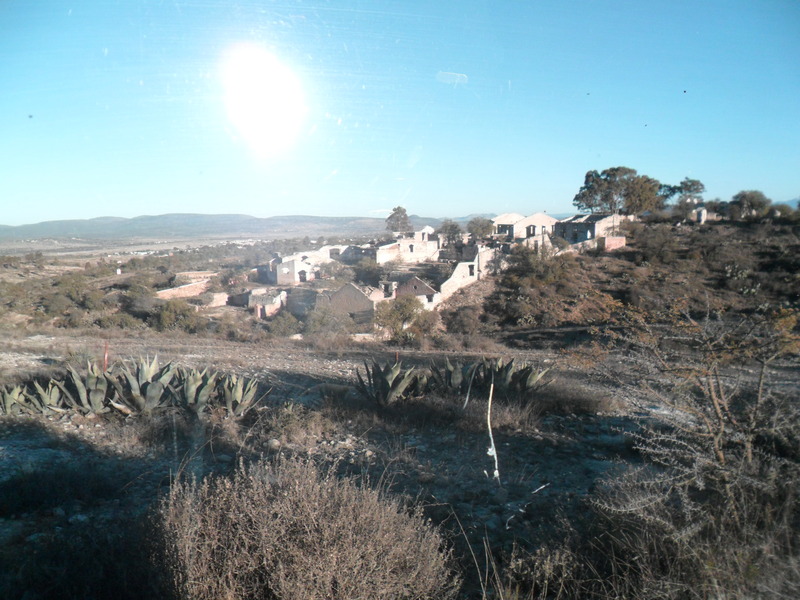 As a group we visited a Chichimeca indigenous reservation in San Luis de la Paz, Guanajuato. We were accompanied by bilingual teacher Emmanuel. The Chichimeca are one of the only indigenous people who were not conquered by the Spanish. Emmanuel is Chichimeca, he speaks Chichimeca Jonaz and Spanish. He grew up on the reservation and is a very intelligent man who through education is helping his indigenous community. The Chichimeca are treated as third class citizens. I felt strange entering the Chichimeca reservation because I felt as if I was invading the community’s space. The indigenous people of the reservation could automatically tell that we were not from there because of our clothing and our physical features. Emmanuel showed us around the Chichimeca elementary school. We walked into a first grade classroom and sang some songs for the children. The most intriguing part was that the teacher, Valente, asked the children how many of them spoke fluent Chichimeca Jonaz and less than half of the children raised their hands. Valente explained that it is harder to keep cultivating their native tongue Chichimeca Jonaz with the younger generations. “The younger generations are embarrassed of speaking their native tongue outside of the reservation,” explains Emmanuel. Emmanuel explained his projects for the reservation and also explained how we as a group could help. I really admire him, he is committed to maintaining the culture and helping his community through education. After all the learning we played a game that included a wooden ball soaked in diesel that was lit with a torch. The ball was literally on fire the whole game, and we were given croquet-like sticks and ask to hit the ball until we scored. First, we were given a demonstration by the sixth graders, then we were asked to play. We were warned that the ball was not to touch our legs otherwise we could get burned. It is an ancient Chichimeca game and it is still practiced on the reservation. Most indigenous communities in Mexico compete on a national level. Then we visited a pre- Hispanic music museum and we saw a lot of the instruments used by indigenous cultures. We learned how and what the sounds of the different instruments meant. As a group we also learned a few words in Chichimeca. We visited Mineral de Pozos in San Luis de la Paz and saw how a once flourishing and promising town turned into a ghost town. The town was most known because of its minerals and there was a lot of mining in the area. All there is left now is a deserted town that has many ruins and ancient buildings. We spoke to some of the people and they told us some of their experiences and worries about the future of the town. We were in the area the whole day and we spoke to many people. As a group we did so many other things and it is impossible to write it all down. I learned so much from bilingual teacher Emmanuel and from the people on the reservation. The city of Guanajuato is beautiful, it is my first time in the city. The host family that I was put into is very warm and open. My host family’s home is in the hills of Guanajuato; which is why I can see the city of Guanajuato from the terrace. I actually have to walk 20 minutes to get to the CIEE office, it definitely is a lot of exercise. So far we had meetings everyday at the CIEE office. 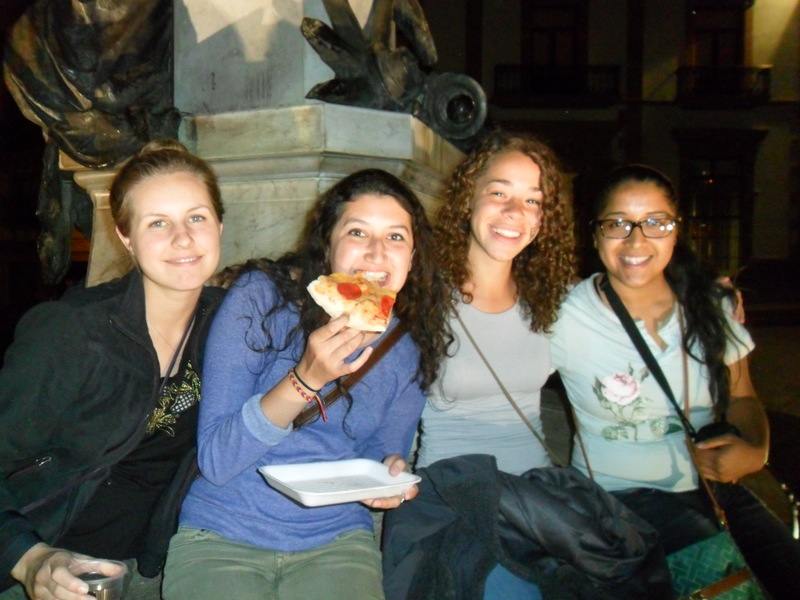 We have already done a scavenger hunt race around the city with other students. Yesterday we met with all the foreign exchange students and the nationals from other parts of México who are studying at the University of Guanajuato this semester. The host spoke very clear as to the distinction between foreigners and nationals, he said “raise your hand if you are a foreigner which means you are not Mexican.” I didn’t know whether to raise my hand or not, even that simple question had me thinking because my nationality is Mexican but I do come from a US university. This is one of many questions that I will be asking myself during my stay here. I am so excited to start classes already, I want to meet the students and the professors. 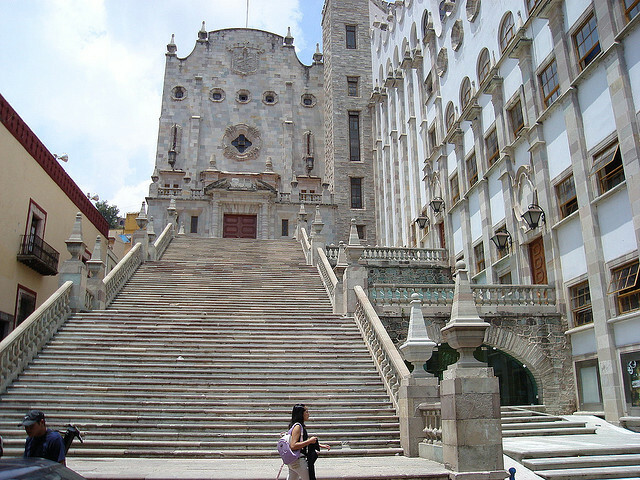 I have not yet been inside the University of Guanajuato, but I have to climb “Las escalinatas” (the stairs leading up to the building in the picture). I look forward to learning more about the history and literature of México.